The Justice of Our Cause – Ordo Militaris, Inc. Statue of Blessed Pope Urban II (Eudes de Châtillon). Châtillon-sur-Marne, France. The concept of using military force to defend and liberate Christians is as old as the Bible itself. Already, in the First Five books of the Bible, written by Moses, God orders Moses to undertake wars to defend His people and to obtain for them the Land He has promised them (For a complete list of wars in the Bible, see here). Under the New Covenant, in which the Son of God became Incarnate to be our Prince of Peace, Christians are obliged not to undertake wars for unjust means, but are obliged to seek to restore the order of justice by means of warfare, when this is necessary. The concept of a military order of Christian warriors thus does not arise with the Crusades, even though it becomes most manifest in them. 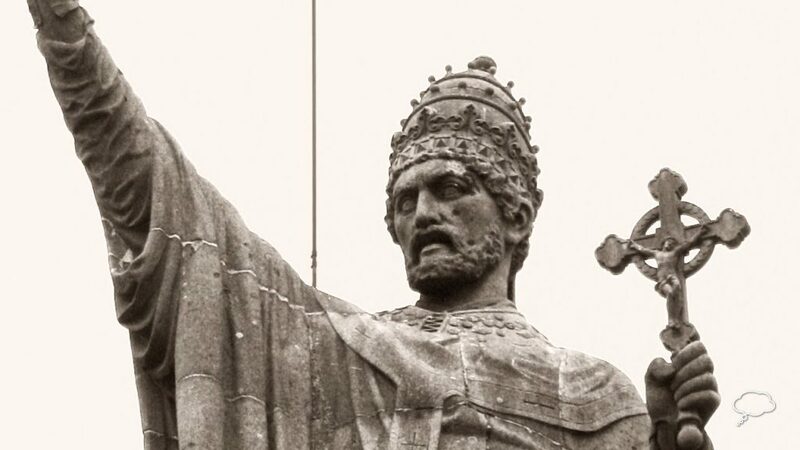 After centuries of being butchered and subjugated by Muslim armies and raiders and pirates, Pope Blessed Urban II, during the Council of Clermont, and at the request of the Emperor of Constantinople, Alexius I, called the first Crusade on the 27th of November 1095 A.D. The military orders of the Middle ages had their beginnings from loose associations of soldiers and pilgrims who came together with the expressed purpose of defending the Holy Places in Jerusalem and the rights of Christians to make pilgrimage there. Later, the as the wars of the Crusades were directed ay restraining the expansion of Islamic states which were bent on persecuting Christians, the military orders took on a more general role. In the Middle Ages, the Military orders were founded by the active participants in war. Though this is preferable, in modern times one can concede that there is also a role to be played by those who, while not fighting, support those who do. Indeed, a modern Military Order will of necessity require a vast number of Catholics who support the effort of the men who fight, since modern warfare is much more complex and expensive. For this reason, to form a Catholic Military Order in modern times, it makes sense that Catholics of every kind collaborate to raise the funds necessary, recruit the military personnel, assist in their training, support and medical care, and serve as a support network after their military service. In short, a modern Military Order will have to be organized like a private army of volunteers. For this reason, this Catholic Military Order, which is proposed here, is NOT an association of individuals who merely want to revel in the nostalgia of the past or enjoy honors or social events, but rather MUST be those committed to aiding, supporting and participating in, each in his or her capacity, the military and police actions necessary to defend fellow Catholics from those who hate us on account of our Holy Religion. Is this kind of thing lawful? The answer is yes. It would have the form of a Catholic religious-military organization, and be organized similar to a Private Military Company (See the Wiki Article), which would raise the funds to provide free services to Catholics threatened throughout the world. Numerous nations already employ or recognize such companies, so there is a well established modern precedent. The difference would be that our members do their work principally for religious motives and not for profit and that we be self-funded through an international network of member charities. In such wise, by joining the forces of willing Catholics from all over the world, together, into one association with a common purpose, both military and support of the troops, a modern Catholic Military Order, in compliance with all national and international law, can effectively attain its goal, the defense and liberation of Catholics oppressed in hatred of their faith. On the practical level, this means that we are forming an International Association and will begin to organize national chapters with the means to raise funds, establish training camps, and forge those relationships necessary to promote the activities of the Order internationally, leaving it to the Catholic military men to organize themselves and make such decisions as need to be made by experts like themselves. Finally, as is evident, since the existence and purpose and justice of a Catholic Military Order has been established and defined and defended by the Catholic Church for more than 900 years, it is not necessary for members of a modern Order to have the expressed initial call to action from the Holy Father or local Bishops, because such as is the good work which is proposed to be done, that all can be assured that it is a thing so greatly pleasing to the Divine Majesty to take up arms to defend fellow Catholics when and where necessary, that all who participate can be assured of the grace and blessing of God in this world and the world to come, if they but persevere as His faithful servants unto the end, just as Blessed Urban II preached at Clermont in 921 years ago. If you would like to support the Order by a financial contribution, you can make a donation via PayPal or credit card, just go to our Donation Page.